Yesterday, we rolled out a new project on our Patreon site. I've been kicking it around for some time, but I have finally got enough details straightened out that I want to take this one out of the lab and into the light. Above is the first panel of a web comic set in the Star Traders universe. In the next moment, you'll get a chance to meet the protagonist, the Captain, who is lying on the ground with a hexshell wound. That will be the first Choice Moment. I will be asking all Patreons with voting rights (pledging at $2 / month or higher) to vote on different options to steer the characters and story (see below for the entire prompt). As the story progresses, I will keep polling our Patreons to make decision -- both big and small -- about the story, events, and characters. As a Patreon, you can share the driver's seat. At this point, the key question is interest. Is this a project that gets you excited and you'll be eager to vote? Let's find out! 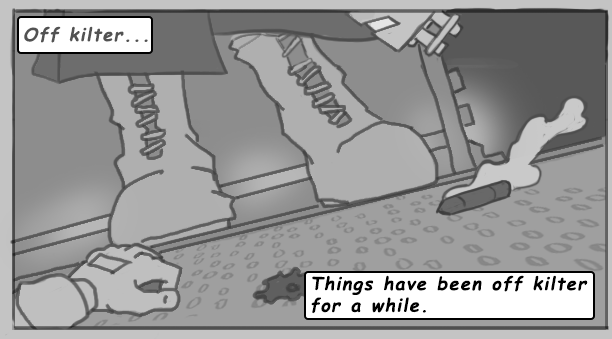 For the foreseeable future, the comic will be gray scale. Sign up with a small monthly pledge on Patreon today to join in the Choice Project.